xoxo, Jen: What is cuticle? The cuticle is an epidermal layer of skin that is virtually invisible. It grows out in a thin layer attached to the top of the natural nail plate from the underside of the eponychium. What most people call the cuticle is actually the eponychium. Cutting, picking, or any other attempt to remove the eponychium should be avoided at all costs. Doing so greatly increases the risk of paronychia (a nasty painful bacterial infection). On top of the dreaded P word, the body replaces the cut/torn/eradicated skin with scar tissue and/or calloused and hardened eponychiums. If you or someone you love cuts their eponychiums, get them to stop. Have them use softening and exfoliating products like Alpha Hydroxy creams, CND Cuticle Eraser, and pure lanolin to soften and exfoliate the hardened skin. They can even use a gel or creamy cuticle remover, which will help to remove the dead cuticle. 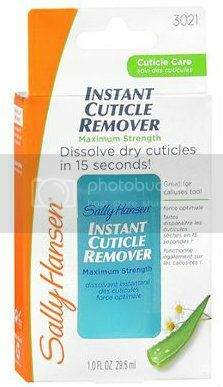 My favorite is Sally Hansen's Instant Cuticle Remover in the blue bottle. The purple arrows shows the stuff you will want to remove, the red arrow is what you want to leave be. Usually, the purple arrow portion is not visible but thanks to acetone it showed so I could photograph it for you! The red arrow is the eponychium which seals out bacteria to prevent infection, and is the part you'll want to moisturize daily and let it do its thang. Go forth and treat your eponychiums well! This has nothing to do with your current post, but I just found your blog today and basically went through every post. I don't know if you're still into bath & body stuff, but have you ever tried Black Phoenix Alchemy Lab? :D Thanks for finding me! And yes! I love me some bpal! I hope you enjoyed your read, some of the older photos and such were some that I copied here from flickr - hope those weren't too much of a bore! I've read about Nfu-Oh on other blogs as well and its definitely on my wishlist to try once I have used up the remover I currently have. Your cuticles and surrounding skin looks very well cared for! For something different, I'd suggest trying a lotion or cream containing hemp oil. Hemp helps skin cells regenerate and is the best oil for skin, next in line is jojoba oil. I believe Sally's has a travel sized hemp lotion and the Body Shop carries some hemp products as well. I like getting small sizes so I can carry them with me and they're good for trying out something new without investing too much. An alpha hydroxy lotion like amlactin will help keep skin fresh looking, perhaps alternate it with your usual moisturizer. Best of luck on your hunt, and let me know what you find to work best for you! Thank you for letting me know about the eponychium thingy. Whenever I have gotten my nails done professionally I have seen them pushing it and even cutting it a little, so I thought it was ok to do. (Truly I only push not cut) One of my fingers has been hurting when I touch that part and had before from the nail technicians so now to figure out how to get it to heal. I know that you gave the advice, but having to get rid of the cuticle that grows without touching the epon...you know. Thank you again for the great advice. Cuticle nippers can be used if there is dead skin hanging. Often times once the cuticle is pushed back it tends to cling to the nail plate and kind of hang there. I usually use a terry towel and rub a little. The rough surface of the towel is good at getting it to detach and much safer than cutting. If you do choose to cut, make sure the skin is dead and hanging. I have seen pros use nippers to cut hanging dead skin. The key is that its dead - if they're cutting live tissue make them stop. For healing I'd suggest Neosporin or similar generic product, and either baby that area when using your hands or wrap it in a band-aid but be sure to give it some air time too.